Continuing our series of behind- the- scenes interviews with the RIFT Team, Community Manager Eric “Ocho” Cleaver sat down with Senior Designer Chris “Tacitus” Cates to learn all about him and his work on Instant Adventures! Ocho : Could you please introduce yourself? CC: Hi, I’m Chris “Tacitus” Cates. 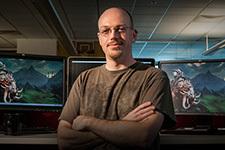 I’m a Senior Content Designer on RIFT. Ocho: Can you tell us a little more about your handle “Tacitus”? CC: I’m a really big fan of Roman history, and Tacitus was one of the first historians who approached history with a more objective slant (rather than glorifying his patrons), but he also had a sarcastic sense of humor I like. I do try and keep my sense of humor constructive though…. Ocho: How long have you been at Trion? CC: It’s been about 5 and a half years now. Ocho: Can you tell us a bit more about your job? CC: I do a bit of everything, although I’m the main Instant Adventure guy these days. I’m not the one who came up with the idea, but as soon as I saw it I fell in love with it. I just took the idea and ran with it. I also make a point of keeping an eye on older content, things like world events, and make sure they continue to work properly with all the other new content we introduce to the game. I like getting involved in a lot of different activities and working on lots of different kinds of things. RIFT is great that way, there’s always something different to work on. Ocho: What are some of the things you’ve worked on over the years that players might recognize, aside from the recent release of Hammerknell IAs? CC: I did the Iron Pine and Freemarch zone revamps and co-created the original Marshall Kane story arc with Morticus. I’ve done World Events, the Fae Yule Instant Adventure, the Goboro Reef Quest, and lots other of things here and there. Too many to count really! Ocho: So what was it like to adapt a raid to Instant Adventures? CC: Well the project came about from an idea someone mentioned three years ago. I instantly knew this was something I wanted to do, but there were a lot of under-the-hood revamps of how IA needed to work that had to be done before we could tackle it. Of course I kept championing it at every opportunity. Mentoring was a really important part of what was needed. I always really wanted to allow all players to visit and play in these amazing places. The raiders had seen it, but I wanted to be able to play there, too! And I wanted to do more in these places than what is normally done in a raid, where you kill some mobs and then a boss. Kill some mobs and then a boss. As soon as I got the time allotted, I jumped in and went. Ocho: Where do you see Instant Adventures go next? CC: I’m working on Tarken Glacier now, but in the future I’d definitely like to do more raids. I want to do Planebreaker Bastion. I want to do Infernal Dawn. I’d like to work on raid Instant Adventures side by side with the Raid Team as the raids themselves are being developed. Ocho: So you mentioned you like playing RIFT, what are your favorite things to do in game? CC: Open-world content and Warfronts. I do a lot of PvP; I’ve gotten 4 max-level characters playing on Seastone. I’m not much of a dungeons and raids kind of guy. Artifact hunting, achievement hunting, zone events, obviously Instant Adventure of course. I like a lot of the other features of the game, like Dimensions and Wardrobes. I’m really happy with the recent changes to the Wardrobe system! Ocho: Thanks for taking the time to talk to me! Do you have any final questions for the players? CC: Yes – where do you want to go in Instant Adventure next? What raids? What zones? Do you have any cool ideas you’d like to see us implement? Now it’s your turn, Ascended. Head to the forums and post your answers, the team can’t wait to hear from you! Echoes of Madness Brings Instant Adventure to Hammerknell!